HomeHeadphone ComparisonsHD 598 vs. HD 599 | AN UPGRADE? HD 598 vs. HD 599 | AN UPGRADE? Before we get into the HD 598 vs. HD 599 comparison, grab a snack, sit back and relax because..
Click to navigate the article! Type: Open Back. Closed back vs. Open back headphones. Impedance: 50 Ohm. What is Headphone Impedance? Frequency Response: 12Hz – 38,500kHz. Sensitivity: 106 dB/mW. What is Sensitivity in Headphones? The open back HD 599’s continue in the tradition of Sennheiser’s detailed, rich, lifelike sound, without distortion or muffle. They are supremely comfortable as always, and the headphones themselves have some weight to them. The sound this time around is tighter, more focused, and boasts a deeper bass response. While the Soundstage isn’t as wide, the overall signature feels like it has a greater sense of purpose and direction. One thing in particular to note is the bass. It digs down deeper than both an HD558 as well as an HD 559, but not quite as much as the HD600. Learn more: Sennheiser HD 600 Review. What about the Pros & Cons? Good impact, especially for an open back headphone. Lightweight and comfortable. This is pretty much a given for anything Sennheiser. Comes with 2 cables: One terminates in a 1/4″ jack with a 3.5mm adapter, and the other is a traditional cable that terminates in a 3.5mm jack with a 1/4″ adapter. Easily driven by an amp. The best headphone amp for the money! Detailed in the treble with nice sparkle. Intimate sound. Accurate Timbre. What is Timbre? Though comfortable, they aren’t quite on the level of an HD558. You will notice them more due to the clamp pressure. The adapter is a bit bulky. An amp isn’t mandatory but is recommended for an enhanced overall sound. How to choose a Headphone Amp! Jump to Amp & DAC Section. Gaming. They come across as more open and airy in a gaming environment. Great imaging here. Learn more: The Best Headphones for Gaming! These will do well with most any genre though, so fret not! The Soundstage on these isn’t quite as large, wide, or impressive as the HD558 or HD598. What is Soundstage? You may not always need amplification for these, as sometimes the bass can get a bit too overpowering. These aren’t as relaxed sounding as an HD558, or a 598 for that matter. The 599 is very honest, and will expose flaws in the recording. This is especially true for Rap/Hip-Hop type stuff. You may need a New Fantasia cable. I have one and it’s really durable! The cables that come with the 599 are a bit on the flimsy side. An updated headphone in all regards. Soundstage isn’t quite as big, but the bass, treble, and mid-range, and build are all improved. Both have velour ear pads. Both are open back. Closed back vs. Open back headphones. Both have a 50 Ohm impedance. Both do well for Gaming. See: The Best Headphones for Gaming! Sound. The HD 599’s sound a bit cleaner and more refined by comparison. By and large, the 598 and 599 share about the same sound. The 599 is a little tighter sounding as opposed to the more open 598, but it’s almost not discernible. While the HD 599 will do better with pop music, the HD 598 excels with Jazz and Classical type genres. If you’re preference is to be right up on stage (or closer to the artists), the 599 works better. If you prefer to be a few rows back, the 598 is better. Basically, the 598 is going to give you a slightly more open sound vs. the more focused sound of the 599. While the HD 598 was pretty flat overall, the 599 is more exciting. The 599 has more impact as well. Bass. The bass here is a bit deeper with more thump than the HD 598, but does have a tendency to get boomy at times. For the most part though, the HD 599’s bass is clean with a lot of impact. The 598 by contrast lacks some of this impact, but still sounds good. Color Scheme. The colors are a bit different than the HD 598. The 599’s sport a more modern look vs. the elegant feel of the 598. Fit. The clamp pressure is a bit tighter on the HD 599, but does open up over time. Build. The build quality of the 599 is a little better than the 598. The 599 is a bit heftier and not quite as loose feeling. The ear cushions on the 599 are a little stiffer as well. Treble. The treble on the HD 599 is more forward and extends farther. While the 598 could be a bit bright, the 599 is not. It’s smoother by comparison. Mid-range. The mids on both are very similar, but the 599’s are a little more forward and aggressive. Overall. The 599’s will work with a wider variety of genres than the 598’s. Padding. The Headband padding at the top is faux leather, as opposed to the velour of the HD 598. You won’t absolutely need an amp per se, but these are some great solutions to keep in mind regardless. Comment below if you have any questions!! Check price on Schiit’s website! The go to desktop solution. Learn more: Schiit Magni 2 Review. These have a minuscule output impedance of less than 0.1 which makes them compatible with nearly any headphone. What is Output Impedance? I’ve been using them on my desktop for quite awhile with a plethora of headphones, and they do not disappoint. You’re getting an incredibly clean, crisp, and neutral response which makes the amp extremely valuable for a wide range of cans. I even got to try them with a Focal Utopia and the sound was absolutely marvelous! LEARN MORE ABOUT IT IN MY SCHIIT MAGNI 2 REVIEW!! If you only have $100 or less to spend, this is the Amp/DAC combo to get without question. With an output impedance of less than 1.04, it will also power most headphones without issue. I would steer clear of trying to use it with 600 Ohm headphones, as well as power hungry planar magnetics with their weird drivers. 😛 What is a headphone driver? However, these will work with cans like the HD600, and the amp is more capable than some give it credit for. I love the crisp and neutral sound these provide. Comes with coaxial out, line out, and USB. Very clean signal, lots of detail. You’re going to be completely amazed with what this little box is capable of. It’s good! You like! JDS Labs 02 with the Modi or a DAC Magic. Check price of 02 on Amazon! Check price of DAC Magic on Amazon! Designed and built by NwAvGuy (Northwest Audio Video Guy), this amp has an output impedance 0.54 ohms. Sound wise, it slightly edges a Magni 2 but this is when I paired it with the Cambridge Audio DAC Magic 100. I have yet to test it with a Modi, but I would still say the Amp provides an ever so slightly cleaner and more resolving sound than the Magni. This may be my imagination though. 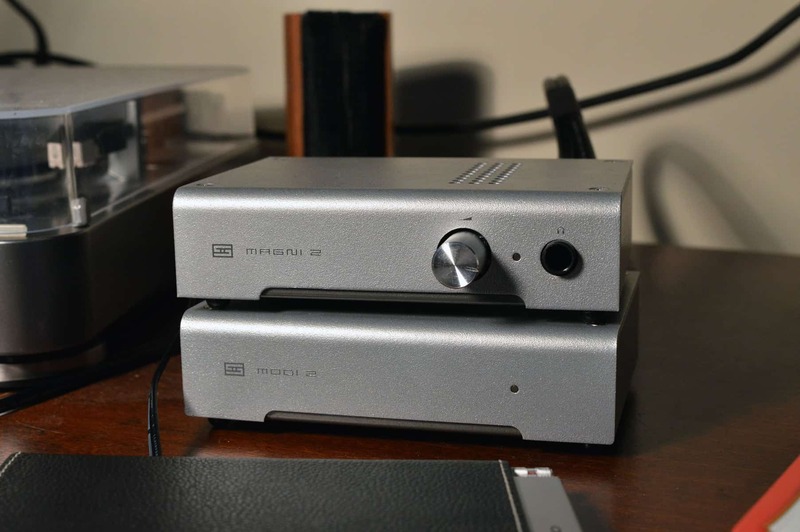 This amazing little Amp/DAC combo may be all you ever need, as you won’t want to upgrade for quite awhile. A reviewer on amazon even said it powered his HD800’s phenomenally well too! What I love most about this little stinker is how portable it truly is. If you’re on the go a lot like me, you’ll find it incredibly easy to throw into a laptop bag or even your pocket! Once you reach your destination, whip it out and stick it in the hole! It’s really that simple. If you desire to pair it with your phone, that’s cool too. You’ll simply need this adapter which is very cheap and gets glowing reviews. If you’re interested in learning about the Black vs. Red: Audioquest Dragonfly Black vs. Red. The Oppo HA2 is the best combo that I’ve personally heard thus far. Sadly, Oppo has since stopped making products. That said, I still recommend this Amp if you can get it at a good price because it sounds absolutely fantastic and provides an all in one solution for your desktop or on the go! It’s the most durable and heavy duty out of all the portable Amp/DACs I’ve tried, and everything feels solid to the touch. I love how the volume knob feels, and it has a bass boost and gain switch in case you’re feeling frisky. To put it another way, after you purchase this beast you’ll likely be set for life! READ THE GLOWING REVIEWS FOR YOURSELF!! LEARN MORE IN MY: OPPO HA2 REVIEW! So what’s the final word, bird? Sennheiser took an already great headphone in the HD 598 and made it better across the board with the HD 599. I would say that if you’re looking for a more open sound, the 598 is a bit better, but it’s honestly very subtle and may not even be noticeable to the average person. If you’re digging the more focused sound of the 599, I don’t blame you. Everything is better, from the mid-range, to the treble, to the bass, build, and everything in between. Interested in reading some reviews? SEE THE HD599 FOR YOURSELF ON AMAZON!! Well that’s about it for today my friend! I hope you’ve enjoyed this article on the Sennheiser HD 598 vs. HD 599. Which of these are you more likely to go with? What do you think about the HD558 foam mod? I would love to hear from you. Until next time..
Samson SR850 vs. SR950 | SOME KEY DIFFERENCES! Would you go with the HD599’s over the HD600 if you weren’t really interested in getting an amp? For sure. The HD600’s won’t sound loud enough out of a mobile device, and definitely need an amp. With the 599’s you can get away with not having one. It really depends on the type of sound you’re after. The 880’s are very clinical, surgical, and kind of cold with a very bright treble. They are best suited for mixing/mastering and reference. The 990’s are a bass head type of headphone, with a V-shaped response, crisp highs, and a recessed mid-range. The HD598’s are a warmer type of headphone, with great Soundstage and a very balanced response overall. So if you listen to Classical, but sometimes Electronic and also like Gaming, it’s tough. The 598/599 and 880 will be better with Gaming and Classical, while the 990 will be better for Electronic. The 598/599 is the better all around headphone. I may go with the upgraded 599 in your case. The only thing is that it won’t be as good for bass heavier stuff. Hey Stuart, I read the review between the 598’s and the M50’s. The 599’s are $200 right now and I’m at a crossroad until I make a bigger investment on better headphones and a dac/amp. I want a gaming headphone with a good amount of bass for rap/EDM but, will be clearest doing so of course. While half a year from now, I will buy something with more.. “subtle tones” and treble. I am very curious of the bass and gaming difference since the 599’s a open back. Your situation is tough because both of these (598 and 599) are great for gaming but you’re not going to be satisfied with them for EDM or Rap. Myself? I think there’s enough bass for those genres, but it’s not going to slam like you desire. It’s more of an articulate and textured bass. You’re able to actually hear each individual note. I’ve come to prefer that over a pure slam, although there are times when I simply want that deep impact. For those times, I use the Crossfade M100, but that’s not open back. So.. basically you’ll have to make a compromise, or buy an open back and a closed back. Which would you prefer investing in right now? I presume an open back? hi. nice review 🙂 I was gonna buy the 599, but i read in you review that the soundstage is worse, but the overall sound is better. how much worse is the soundstage. is the tradeoff worth for the better overall sound compared to the 598? Wow that reply was fast 😉 ok my situation is that i had the 558s and am returning them because the broke. now i planned to buy the 599s because i can just buy them with money that i get refunded. i use them mainly for gaming and occasionally for music and movies. also i have another pair of headphones(philips citiscape downtown), which are surprisingly good and have nice bass. so what i’m particularly interested in is to know how much the soundstage worsened compared to the 598s. is it a noticeable downgrade for someone that is not too much of an expert when it comes to audio? i’d like to know if for example listening from where footsteps come will get noticeably harder in games in the 599s compared to the 598s. thanks for the fast reply and sorry for my broken english. Both the 598/599 are some of the best around for gaming. If you’re looking for the absolute best for Gaming, the 900x would be your best bet. Check out: The Best Headphones for Gaming. As for the 599 having a worse Soundstage, or being noticeable: It’s not at all. In fact I’m going to edit the article to reflect the fact that there is really not a huge discernible difference between the two headphones. It takes some extended listening time to tell. Here’s a direct quote from Sennheiser: “The HD 598 and HD 599 are extremely close in sound performance, with a slightly tweaked driver. Indeed the specs are the same – it’s mostly a facelift with different colour scheme and materials used. Thank you so much for your extremely in-depth reviews. I am so glad I stumbled upon your site. It was a Godsend for you to answer all the questions anyone would have. You do have a way of breaking down tech speak so we Gronks can understand in common language. Your insights is so valuable. Thank you. Thank you for detail and useful review. Pls i need your help for selecting right headphone for my need. I am looking for Best Open back only. Budget is $200. HD 598 SR ($ 172) 599 ($187) both are presently available for almost same price. I want Headphone for Listening Philharmonic Orchestral Music, Piano Instrumentals, Indian Classical Vocals & Instruments, Sitar Santoor Sarangi Bamboo Flute, Watching Movies & above all Practicing Piano. If Possible, Required better Soundstage, Instruments separation & should be Comfortable for long time wearing. I am confused between this two (or any other model as you suggest) so pls advice me. Which is better for my requirement? Do you require a headphone that’s closed back (meaning you won’t bother others around you), or will you be mostly in a quiet environment? Kindly, I could need a piece of advice in choosing the right headphones. Which would you recommend for general listening of music thru the computer but also for listening and recording of electrical guitar – either thru pc or directly plugged into the amp (solid state amp). Ive read your above review – the HD-599 could be one option, and another could be Beyerdynamic dt-990 Pro. What do you reckon? maybe a third option? Hmm. General listening through the computer and also recording of electrical guitar. Do you prefer closed or open back? Let me know what you think/if you need further guidance, and leave some feedback on the videos as well if you don’t mind!! Hi Stuart, thanks for your detailed review and comparison. I’m currently owning a pair of Sennheiser G4me One’s (the open back ones, based on the 558’s I think) and I have been very happy with them for a long time. Now I’m looking for an upgrade, also because I’m not that much into Gaming anymore and don’t even have the mic plugged in, and also because they got a bit damaged. And yeah, the 598 is just slightly better than the 558 without taking the strips out. I personally love the Soundstage on them, but some people claim it’s not that wide. I kind of agree and disagree. With gaming, I found I was hearing sounds from Fallout 4 all around me, and even thought someone was knocking at the door at one point! With music, they provide a fantastic image as well. For a HD 599 with the intention to use only in the PC to play games and listen to music you recommend an audioquest dragonfly black or a FiiO E10K? I have read in certain places that sometimes these amp / dac give delay in films and games, is this true? I read a blurb about that awhile back but I’m not 100% on it. I would actually save an extra $100 and go with the Dragonfly Red which will be a better investment and work with way more headphones. The Black version can’t handle anything over 100 Ohm while the Red version powers my HD600 with ease. I’ve been meaning to buy one but haven’t gotten around to it. I’ve demoed one on a few occasions and I absolutely love it. Let me know what you decide! If you don’t ever plan on upgrading and/or adding headphones down the line to your collection, you could go with the Black version and be okay (as the 599 has a 50 Ohm impedance). If that’s the case though, I’d rather go with the E10K. Hi, I’m coming from a ATH-M40X and looking for a first pair of open back headphones, how do the 598/599 compare to the M40X ? I know the M40X is a closed back while the 598/599 are open, it’s that I would like to know of a general feel of the 598/599 compared to the M40X. Oh and to add I just have a E10k as a dac/amp, nothing special. Thank you for your time. The bass on the 40x is def heavier than the 598/599. The overall sound of the 598/599 is more open, with better Soundstage for music as well as Gaming. Both do well for many genres, but the 40x is undoubtedly better for Hip-Hop/EDM and the like. Comfort is much better on the 598/599, and build is a bit better on the 40x though there were some issues with the hinge near the ear cup according to many. I haven’t had any issues with mine but I don’t use them everyday so yeah..
598/599 will do much better with Jazz and Classical, and generally lighter, more laid back genres such as Folk and Acoustic as well. Hope that helps! Let me know if you need any additional clarification. Why do some monitoring headphones such as the HD599 need battery, whereas the HD598 and Beyerdynamic DT990 don’t need? Hey Alexeis! The HD599 does not need a battery. Where did you read/hear that? Hi, Stuart. Your site rocks: Down-to-earth advice that communicates technical stuff in an accessible format, avoiding excessive technical jargon. What’s not to like? Quick question (hopefully). I have the HD598’s and have enjoyed them for a few years now. At the moment, the HD599’s are on sale. Do you think it’s worth the upgrade? From what I gather in your review and comments, I’d lose a tad of soundstage, but gain better overall clarity in sound. Specs: I use the HD598’s both on the go and with my Mac. I use them for gaming and for listening to pop, rock, classical and jazz (including latin), with some EDM. I don’t touch rap/hip-hop. Hey John thanks so much for the kind words! Sorry about the late reply. I think you should go for the 599 if it’s on sale. The 598 sometimes has this weird wooly quality to it and I’m sure you know what I’m talking about. Let me know what you decide!